Lennon (1863) had found it on the Tinwald Downs. Buchanan White of Perth (1895) listed it as occurring in Colvend and Southwick parishes (VC73). Gordon (1913) found it common on heather blossom in the Corsemalzie area, with the larvae common in sallow catkins on 15th April 1906. Earliest date was 14th August 1910. Sir Arthur Duncan (1909-84) during his lifetime had found it at Closeburn, Tynron and Castlehill, Dumfries (all VC72). Buchanan White of Perth (1895) listed it as occurring in Colvend and Southwick parishes (VC73). During 1974-93 six of the seven Rothamsted stations managed 120 records, Caerlaverock not recording it. From 1993 to 2010 the regular trapped sites at Kirkton, Durisdeer, Mersehead RSPB and Old Torr, provided most of the 200 records, with others from scattered sites across the region. 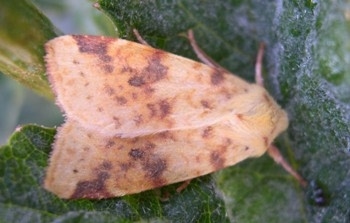 This yellowish form with faint orange crosslines was first noticed by White in 1870. Since then we have had a handful of records from Dumfriesshire and Kirkcudbrightshire, but I feel it is not being recorded as such. One generation. Overwinters as an egg on the foodplant. Larvae are present from late March to early June. Pupation takes place about six weeks later from an underground cocoon. The larvae feed on the catkins of sallows and poplars, later moving to docks and such like. Wherever there are sallows and poplars.